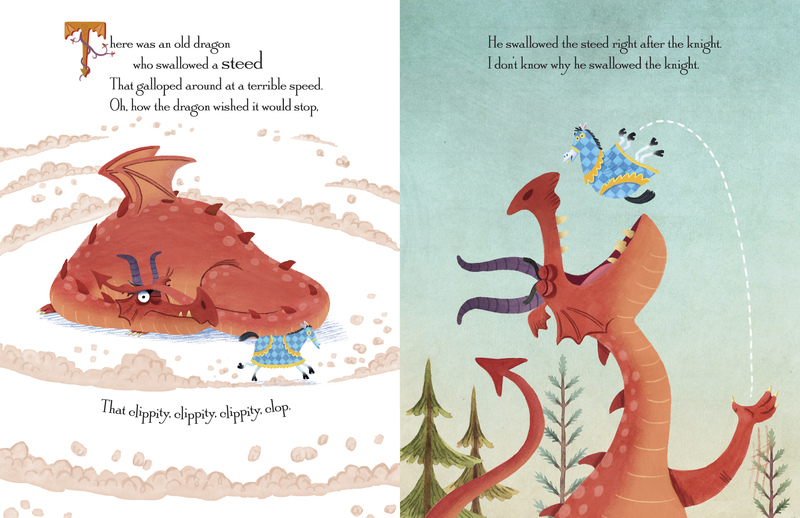 “Plus one very hungry old dragon add up to a hilarious and rollicking tale about a dragon who just can’t keep his mouth closed . . . at least not until he eats almost everything in the kingdom. Do you remember There Was an Old Lady Who Swallowed a Fly? Forget about her and that fly. There is an old dragon in town and he is out to swallow the entire kingdom. He can fly, but he doesn’t swallow any in this retelling of the classic fairy tale. Indeed, it is not polite for the dragon to devour nearly the entire kingdom. All that is left is for dragon to do is wash down his dinner. The dragon’s stomach is now chopping and churning. He is about to lose his lunch—or was that dinner. Out comes the castle, the lady, the cook, the squire, and the steed. The knight, who dismissed the signs while looking for danger, remains in the belly of the beast. 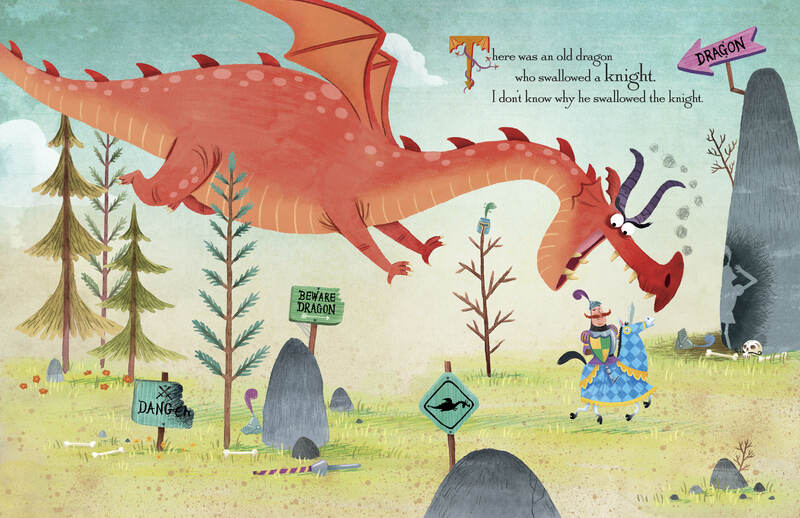 There Was an Old Dragon Who Swallowed a Knight, is a fractured fairy tale extraordinaire. Reading this debut picture book is easy and fun. The humor is delightful. 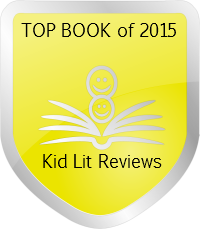 Children will adore the bright orangish-red dragon and the knight’s repetitive protestations. The rhyming is spot on and has the singsong quality I love in picture books. Children will quickly pick up the lines and recite them along with the reader—or read the book by themselves. Ms. Klostermann’s tale will have kids excited to learn. The illustrations are wonderful. From the orangish-red dragon to the moat of alligators the images will delight children. Each spread adds to the story, making the text come alive. Kids can visualize the dragon’s stomach thanks to a “window” in his belly. There the knight protests the rudeness of this swallowing business as more of the kingdom falls a top him. The small details are wonderful. The dragon may have swallowed the cook, but he missed the basket of escaping frogs and the chicken hiding behind the cart of fruits and veggies. 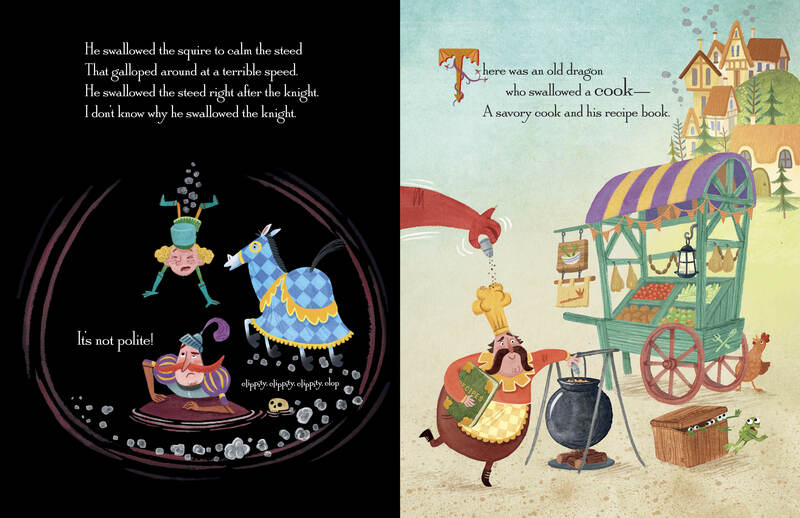 In the dragon’s stomach, the cook goes back to his stew and the knight looks on terrified. Those kind of details adds depth to the story, filling in details the prose must leave out. 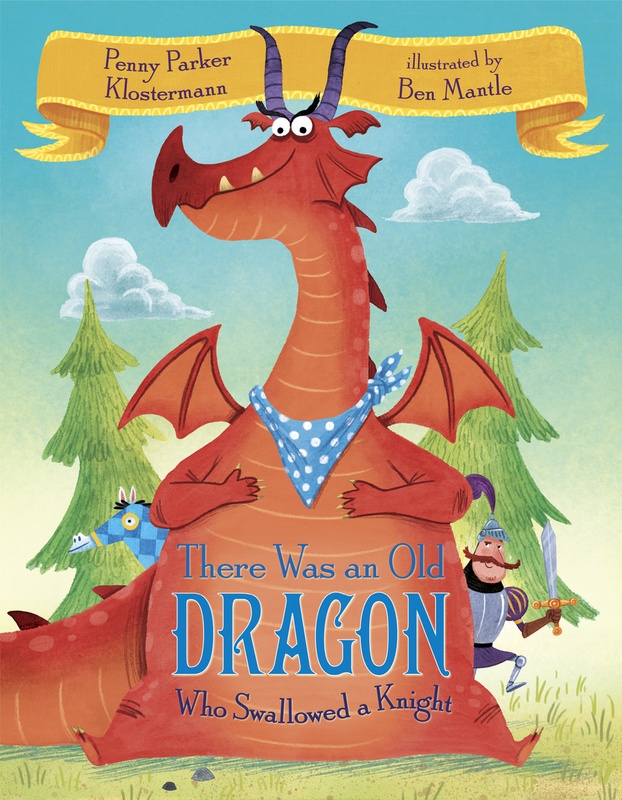 There Was an Old Dragon Who Swallowed a Knight is Ms. Kostermann’s first picture book. With the help of Ben Mantle’s illustrations, Klostermann has hit a home run, or should I say, she has slayed the beast. This wonderfully creative team will pair up once more in 2017 with the release of A Cooked up Fairy Tale. Parents will not mind reading There Was an Old Dragon Who Swallowed a Knight a million times, which is good, because kids will be asking for this bedtime story for nights on end. Warning: Expect repetitive squeals of delight! THERE WAS AN OLD DRAGON WHO SWALLOWED A KNIGHT. Text copyright © 2015 by Penny Parker Klostermann. Illustrations copyright © 2015 by Ben Mantle. Reproduced by permission of the publisher, Random House Children’s Books, New York, NY. Purchase There Was an Old Dragon . . . at Amazon —Book Depository—iTunes Books—IndieBound Books—Random House Children’s Books. Want a Signed Copy? Go to the Texas Star Trading Company HERE and leave details in the Gift Message field or call (325) 672-9696. Learn more about There Was an Old Dragon . . . HERE. Find the Activities Guide HERE. This is such a fun and thorough review, Sue. Thanks so much! This is some great debut picture book, I think! 😀 SO clever! Snarls, and you, will adore this old dragon (claims to be 600-years-old). The ending will have you, or rather Snarls, snorting! I bought this for my granddaughters who adore it. Great review for this wonderfully silly tale. Thanks, Linda. I’m so glad she liked this. Gah! This looks hilarious. Can’t wait to get a look at it. I love seeing inside the dragon’s tummy. Genius!